Since the 1960s, participatory discourses and techniques have been at the core of decision making processes in a variety of sectors around the world ? a phenomenon often referred to as the participatory turn. Over the years, this participatory turn has given birth to a large array of heterogeneous participatory practices developed by a wide variety of organizations and groups, as well as by governments. Among the best-known practices of citizen participation are participatory budgeting, citizen councils, public consultations, etc. However, these experiences are sometimes far from the original 1960s? radical conception of participatory democracy, which had a transformative dimension and aimed to overcome unequal relationships between the state and society and emancipate and empower citizens in their daily lives. This book addresses four sets of questions: what do participatory practices mean today? ; what does it mean to participate for participants, from the perspective of citizenship building? ; how the processes created by the participatory turn have affected the way political representation functions? ; and does the participatory turn also mean changing relationships and dynamics among civil servants, political representatives, and citizens? 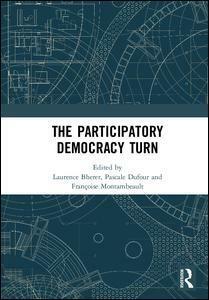 Overall, the contributions in this book illustrate and grasp the complexity of the so-called participatory turn. It shows that the participatory turn now includes several participatory democracy projects, which have different effects on the overall system depending on the principles that they advocate. This book was originally published as a special issue of the Journal of Civil Society.